Toll-like receptors (TLR) are pattern recognition receptors that recognize conserved molecular patterns on microbes and link innate and adaptive immune systems. We investigated whether the enhanced susceptibility to bacterial, yeast, and viral infections and poor adaptive immune responses in aging are a result of diminished expression and function of TLRs. We examined the expression and function of all murine TLRs on macrophages from young and aged mice. Both splenic and activated peritoneal macrophages from aged mice expressed significantly lower levels of all TLRs. Furthermore, macrophages from aged mice secreted significantly lower levels of IL-6 and TNF-α when stimulated with known ligands for TLR1 and 2, 2 and 6,TLR3, TLR4, TLR5, and TLR9 when compared with those from young mice. These results support the concept that increased susceptibility to infections and poor adaptive immune responses in aging may be due to the decline in TLR expression and function. Decline in immune function is a hallmark of aging, leading to increased susceptibility of elderly individuals to bacterial infections of lungs, urinary tract, skin and soft tissues and reactivation of inactive tuberculosis and herpes zoster (reviewed in Refs. 1 and 2). There is an increased severity of pneumococcal, influenza, and respiratory syncytial viral infections in the elderly population (3, 4, 5, 6). For example, an estimated 90% of the 20,000 deaths that are attributed to influenza annually in the U.S. occur in persons aged ≥65 years (7). Age-related changes in the adaptive immune system are well-documented and include diminished and/or altered cytokine patterns, reduction in clonal expansion and function of Ag-specific T and B cells and a decline in Ag-presenting cell function (1, 2, 8, 9). The decline in adaptive immune function leads to decreased efficacy of preventive vaccination in the elderly. In the case of influenza, although the vaccine is ∼70–90% effective in preventing illness in healthy younger adults, it is only 30–40% effective in preventing influenza-like illness in frail elderly individuals (4). The reduced efficacy of influenza vaccines in the elderly is likely, at least in part, due to reduced immune responses to vaccination. As the thymus atrophies with age, there are fewer naive T cells available to respond to new pathogens and neoantigens. This shift from naive to memory cells also causes a shift in the cytokine environment. The expression of cell adhesion molecules on APCs and T cells from the aged declines, possibly contributing to immune dysfunction. Humoral immunity also exhibits changes with age, but to a lesser extent, particularly the diminished ability to generate high-affinity protective Abs against infectious agents. It has been suggested that this may be due to inefficient somatic hypermutation in the V gene segments of the Abs, inefficient help by aged Th cells, and the altered cytokine environment. Similar to the decline in adaptive immune function, the functions of NK cells, macrophages, and neutrophils, crucial cellular components of innate immunity, are decreased with aging (10, 11, 12, 13). In the aged mouse, alveolar macrophages are decreased in number and are not efficient at presenting Ags to T cells, and more macrophages are needed to effectively activate a T cell (5). Neutrophils have impaired chemotaxis, degranulation, and phagocytosis. Because macrophages, NK cells, and neutrophils provide the first line of defense against bacterial and viral infections, the decline in function could possibly explain the increased incidence of bacterial and viral pneumonias and gastrointestinal and skin infections in the aged as well as diminished protective immune responses to pneumococcal and influenza vaccines. This first line of defense is accomplished through evolutionarily conserved sets of molecules, namely Toll-like receptors (TLR)2 that recognize conserved molecular patterns associated with pathogens. Microbes, microbial products, and pharmaceuticals that are ligands for TLR2, 3, 4, 5, 6, 7 and 9 have been identified (14, 15, 16, 17). Ligands for TLR1 and 2, and 2 and 6, are Gram-positive bacteria and yeast cell wall components, while the predominant Gram-negative bacterial product, LPS, is a ligand for TLR4. Recent reports have also documented that dsRNA (poly I:C), bacterial flagellin, immiquimod, and CpG oligodeoxynucleotides (ODN) are ligands for TLR 3, 5, 7, and 9, respectively. The interaction between a TLR and its ligand results in the secretion of anti-bacterial peptides, defensins, and proinflammatory cytokines such as TNF-α and IL-6, which initiate an inflammatory response to clear the invading organism. Furthermore, the inflammatory response results in the recruitment of cells of adaptive immunity to initiate clearance of the pathogens by generating a specific immune response. Hence, defects at the level of expression and function of TLRs with aging could contribute to poor recruitment of APCs, and T and B cells at the site of inflammation, resulting in suboptimal adaptive immune responses leading to increased incidence of illness and complications from infection. To address this, we examined the expression of all known murine TLRs (TLR 1–9) on splenic macrophages and thioglycollate-elicited peritoneal macrophages from young and aged mice by real-time RT-PCR. These macrophages were cultured with microbial products that interact with TLR2, TLR3, TLR4, TLR5, and TLR9 to investigate changes in function with age. We show that macrophage TLR expression and function decline with aging, which may impact both the quality and the magnitude of both innate and adaptive immunity. Young (2–3 mo old) and aged (18–24 mo old) female C57BL/6 mice were purchased from The Jackson Laboratory (Bar Harbor, ME) and the National Institute of Aging (Bethesda, MD), respectively, and were maintained in an environmentally controlled facility. Splenic macrophages were isolated by incubating spleen cells at 3 × 106 cells/ml in a final volume of 15 ml in tissue culture-treated Petri plates for 90 min at 37°C with 5% CO2. Nonadherent cells were removed and the plates were washed twice with complete medium (DMEM (Life Technologies, Grand Island, NY) containing 100 U/ml penicillin, 100 μg/ml streptomycin, 1 mM glutamine, and 5% FBS (HyClone Laboratories, Logan, UT)). To induce activated peritoneal macrophages, 1 ml of 3% thioglycollate (Difco, Irvine, CA) was injected i.p. into young or aged mice. Five days later, peritoneal exudate cells, consisting mostly of macrophages (over 90%), were collected in 10 ml of PBS. Macrophages were washed with complete medium. Nonadherent cells were removed by incubating the cell suspensions for 90 min at 37°C with 5% CO2. The purity of macrophage preparations was assessed by flow cytometry using allophycocyanin-conjugated anti-mouse CD11b (Mac-1) mAb (BD Biosciences, San Diego, CA). Cell surface expression of TLR4 was assessed with PE-conjugated mAb against murine TLR4 (e-Bioscience, San Diego, CA). RNA was isolated with Tri-Reagent (Sigma-Aldrich, St. Louis, MO) from splenic macrophages and thioglycollate-elicited peritoneal macrophages. RNA samples were quantified by spectrophotometric analysis and were treated with DNase before cDNA synthesis with amplification grade deoxyribonuclease I (Invitrogen, Carlsbad, CA), according to the manufacturer’s instructions. cDNA synthesis was performed with 1 μg of total RNA using 1.6 μg oligo(dT)15 primer, 20 nM of each dNTP, and 1× reaction buffer (all from Roche, Indianapolis, IN) in a final volume of 20 μl. cDNA reactions were incubated at 70°C for 10 min to denature the RNA template and were quench-cooled for 5 min. AMV reverse transcriptase (40 U) was added and reactions were incubated at 42°C for 60 min. cDNA reactions were diluted 1/10 and 2 μl of the diluted cDNA reaction was added to a 18-μl Light Cycler PCR containing 0.5 μM of each primer (Table I⇓), 1× Light Cycler-Fast Start DNA Master SYBR-Green mix containing Fast Start Taq polymerase and appropriate MgCl2 (Table I⇓). Reactions were conducted in glass capillaries (Roche) in the Light-Cycler instrument (Roche), subjected to a 10-min initial hot-start activation of the Taq polymerase at 95°C, followed by 40 cycles of amplification (95°C for 10 s, 56°C for 5 s, and 72°C for 10 s). The correct size of the amplified PCR products (Table I⇓) was confirmed by gel electrophoresis. Amplification of accurate targets was confirmed by sequence analysis. For real-time analysis, samples were quantified by a standard curve generated by amplifying three serial dilutions in duplicate of each cDNA template with GAPDH primers as listed in Table I⇓ and the same reaction conditions as described above. Relative units were determined by generating a GAPDH curve, amplifying three serial 10-fold dilutions from 2 μl of the diluted cDNA and allowing the software to accurately determine the relative units of expression for each of the TLRs amplified as compared with the GAPDH curve. Removal of contaminating DNA was verified by adding 2 μl of diluted RNA before cDNA synthesis to an 18-μl Light Cycler PCR containing GAPDH primers. One million cells, from the same populations used for the RNA extraction as described above, were stimulated in a 24-well plate in a final volume of 2 ml with 200 ng of LPS (Sigma-Aldrich), 200 μg of poly(I:C) (Sigma-Aldrich), 3 × 106 BioParticles of zymosan A (Saccharomyces cerevisiae), 3 × 106 BioParticles of Staphylococcus aureus (both from Molecular Probes, Eugene, OR), 20 μg of ODN control (TCCATGAGCTTCCTGATCCT), ODN containing CpG motifs (TCCATGACGTTCCTGACGTT) obtained from GENSET (La Jolla, CA), or 1 μg of flagellin from Salmonella typhimurium (18). 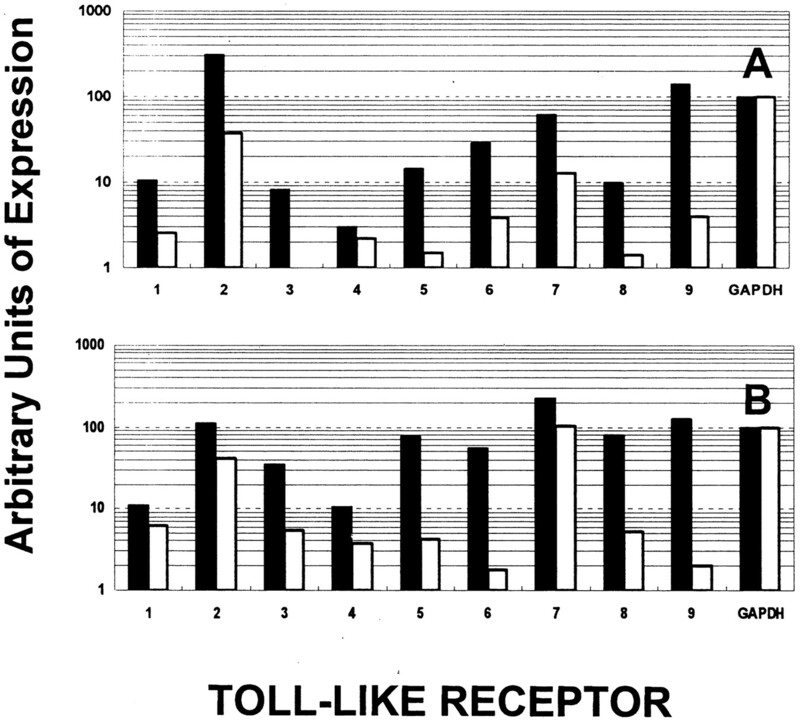 The optimum dose for each ligand indicated above was determined in a dose-response study to ensure that it is the TLR expression that is limiting but not the ligand. Cultures were incubated at 37°C with 5% CO2 for 48 h. Supernatants were collected and IL-6 and TNF-α levels were determined by ELISA using OptiEIA kits (BD PharMingen, San Diego, CA). Deterioration of immune function and the increased incidence and lethality of infectious diseases in the elderly is well-documented (1, 2, 3). Macrophages are important cellular constituents of innate immunity that influence the priming environment in addition to their phagocytic and tumoricidal functions. In this report, we examined the effect of age and the expression and function of various TLRs on splenic and thioglycollate-elicited macrophages. Splenic macrophages and thioglycollate-elicited macrophages from young and aged C57BL/6 mice, which were over 90% pure based on FACS analysis, were used to assess the expression of TLRs 1–9 by RT-PCR as described in Materials and Methods. 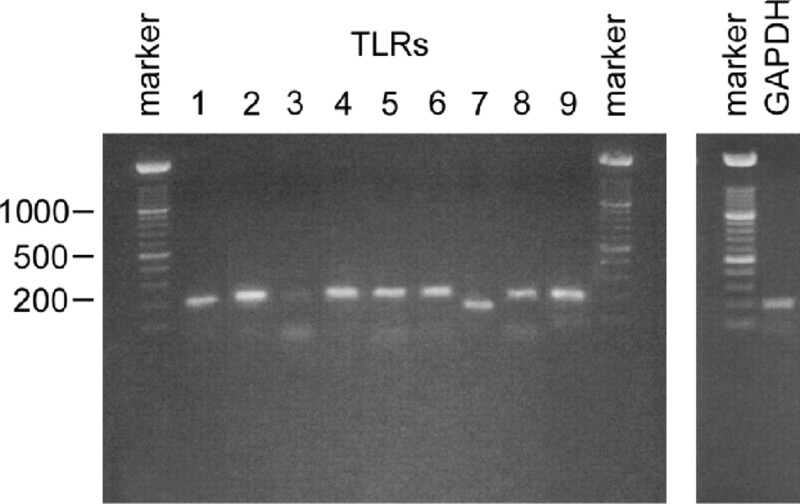 TLR and GAPDH PCR products were amplified and confirmed by gel electrophoresis (Fig. 1⇓) and sequence analysis. Fig. 2⇓ shows the relative units of expression of splenic and thioglycollate-elicited macrophages from young and aged mice relative to GAPDH determined by the Light Cycler. Gel electrophoresis of TLR- and GAPDH-amplified products. Total RNA was isolated from thioglycollate-elicited peritoneal macrophages from young mice as described in Materials and Methods. cDNA synthesis and amplification was performed as described above. An aliquot of these reactions was electrophoresed on an ethidium bromide-stained 1% agarose gel. The resulting fragments migrated with the 200-bp fragment of the 100-kb marker used. The exact fragment sizes are listed in Table I⇑. TLR expression by real-time RT-PCR on splenic and thioglycollate-elicited macrophages from young and aged mice. TLR expression was quantified from splenic (A) and thioglycollate-elicited (B) macrophages from 5–10 young (2–3 mo) and aged (18–24 mo) C57BL/6 mice as detailed in Materials and Methods and expressed as relative units normalized to GAPDH expression. Black and white bars correspond to macrophages isolated from young and aged mice, respectively. The experiment was repeated three times with similar results. The pattern of expression of TLRs in splenic macrophages differs from that of thioglycollate-elicited macrophages indicating that TLR expression varies with the state of activation and anatomical location as well. The most predominant TLR expressed by splenic macrophages from young mice is 2, followed by 9, 7, 6, 5, 8, 1, 3, and 4 (Fig. 2⇑A). Unlike the splenic macrophages, thioglycollate-elicited peritoneal macrophages expressed TLR7 followed by 9, 2, 8, 5, 6, 3, 1, and 4 (Fig. 2⇑B). These patterns have been confirmed by three independent experiments consisting of 5–10 mice per experiment. The pattern of expression of TLRs 1–9 on the splenic macrophages from the aged mice from the highest to the lowest was 2, 7, 9, 6, 1, 4, 5, and 8 and the levels were reduced when compared with those from young mice. Expression of TLR3 was barely detectable in the aged splenic macrophages. The maximum decline on splenic macrophages from aged mice was in TLR9 expression followed by TLR5, 3, 2, 6, 8, 7, 1, and 4 when compared with splenic macrophages from young mice. The pattern of expression of all TLRs on thioglycollate-elicited peritoneal macrophages from aged mice from the highest to the lowest was 7, 2, 1, 3, 8, 5, 4, 9, and 6 as shown in Fig. 2⇑B. There was a maximum decline in TLR9 expression followed by TLR 6, 5, 3, 4, 1, and 7 on thioglycollate-elicited peritoneal macrophages from aged mice when compared with those from young mice. The surface expression of TLR4 on the splenic and thioglycollate-elicited macrophages from the aged mice also declined when compared with those from young mice (Fig. 3⇓). These data indicate that TLRs are differentially expressed on splenic and thioglycollate-elicited macrophages and the expression declines with aging. In addition, translation efficiency differences, mRNA stability, signal transduction defects, and other factors may also contribute to differences in surface expression and also function. TLR4 expression on thioglycollate-elicited macrophages from young and aged mice. TLR4 expression on thioglycollate-elicited macrophages from young and old mice was determined by flow cytometry with PE-conjugated anti-mouse TLR Ab as described in Materials and Methods. The macrophages were gated on CD11b population. 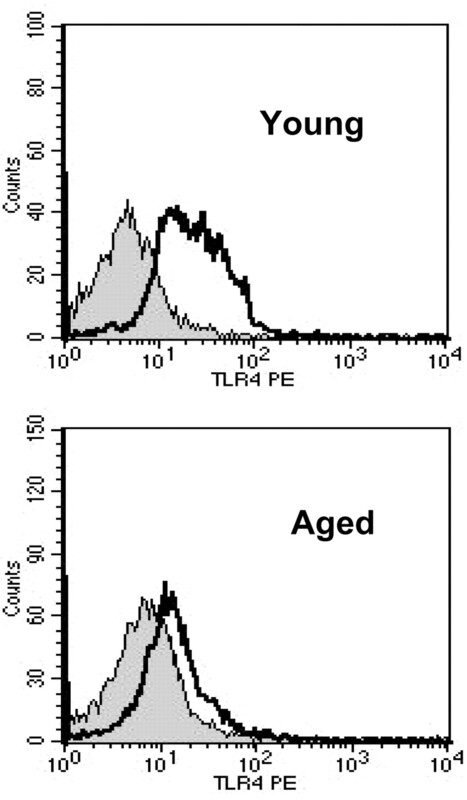 Gray filled histograms represent macrophages stained with an isotype control and the black empty histograms represent TLR4-PE staining. Ligation of TLRs with their ligands leads to NF-κB activation and proinflammatory cytokine secretion by MyD88-dependent and -independent pathways. To correlate the expression of TLRs with function, macrophages from aged and young mice were activated with ligands for TLR1 and 2, TLR2 and 6, TLR3, TLR4, TLR5, and TLR9 and their function was assessed by measuring the proinflammatory cytokines, IL-6 and TNF-α. As shown in Table II⇓, when compared with splenic macrophages from young mice, splenic macrophages from aged mice secreted significantly lower levels of IL-6 in response to LPS (5.3-fold), poly(I:C) (7.7-fold), zymosan A (4.5-fold), CpG ODN (14-fold), and S. aureus (2.4-fold). However, TLR5 ligation with flagellin did not result in proinflammatory cytokine secretion suggesting that splenic macrophages express very low levels of TLR5 and/or the expression of other cell membrane proteins that are required for TLR5 function may be limiting. For example, TLR4 activation requires interaction of CD14, LPS binding protein, and LPS and defects in any of these components could contribute to poor inflammatory responses. It is not clear yet whether other TLRs, apart from TLR4, also require the interaction of other membrane components to function. Thioglycollate-induced peritoneal macrophages from aged mice secreted significantly less IL-6 in response to LPS (5.7-fold), poly(I:C) (5.8-fold), flagellin (6.5-fold), CpG ODN (26-fold), zymosan A (8.7-fold), and S. aureus (1.64-fold) as compared with those from young mice. Unlike splenic macrophages, thioglycollate-elicited macrophages expressed higher levels of TLR5 and secreted significantly higher amounts of proinflammatory cytokines. IL-6 plays an important role in the induction of inflammatory and adaptive immune responses. A decrease in or absence of IL-6 could result in reduced B and T cell responses, decreased germinal center formation, reduced clearance of intracellular bacterial infections such as Listeria monocytogenes, and increased susceptibility to Candida albicans. Our findings are consistent with the earlier observations demonstrating that alveolar or peritoneal resident or thioglycollate-induced macrophages and monocytes from aged mice and rats secrete low levels of IL-6 (19, 20, 21). As shown in Table II⇑, a reduction in TNF-α production was also observed from aged splenic macrophages, with responses to LPS (1.4-fold), poly(I:C) (2.5-fold), CpG ODN (6.3-fold), S. aureus (2.1-fold), and zymosan A (3.3-fold). Similar to splenic macrophages, TLR5 ligation with flagellin did not result in TNF-α secretion suggesting that either surface expression of TLR5 was below the activation threshold and/or poor expression of other cell surface molecules that play a major role in TLR5 function. Thioglycollate-elicited macrophages from aged mice secreted significantly less TNF-α in response to LPS (5.6-fold), poly(I:C) (3.3-fold), zymosan A (2.7-fold), flagellin (6.2-fold), CpG ODN (3.1-fold), and S. aureus (1.4-fold) stimulation. These data indicate that proinflammatory cytokine responses decline with aging when TLR2, 3, 4, 5, and 9 on splenic or thioglycollate-elicited macrophages are stimulated with their ligands. TNF-α enhances class I and class II MHC expression and decreased levels in aging could affect Ag processing and presentation, thus affecting T cell responses (22). Reduced TNF-α levels in aging may also contribute to reduced phagocytic activity, reduced NO, reduced tumor cell killing, and delayed tissue repair process. Decreased expression and function of various TLRs may predispose the elderly to various bacterial and yeast infections. Due to the decline in proinflammatory cytokines, the cardinal signs of inflammation such as fever are absent in the elderly patients. Hence, the increased mortality rates are attributed to lack of presentation of clinical signs at the onset of infection due to poor inflammatory response. S. aureus is the fourth most common pathogen and one of the top 10 causes of death in persons aged >65 years. In addition, the elderly are also highly susceptible to pneumonia and soft tissue infections caused by S. aureus (23). The results of this study indicate that decreased expression and function of TLRs 1, 2, and 6, when ligated with S. aureus contribute to enhanced susceptibility of the elderly to S. aureus infections. Furthermore, decreased function of TLR 2 when ligated with zymosan A (yeast) may help to explain the enhanced susceptibility to infection with C. albicans, Cryptococcus neoformans, Coccidioides immitis, and Aspergillus fumigatus in the elderly individuals (24, 25). The reduced function of macrophages in response to LPS from Escherichia coli used in the current study and LPS from other Gram-negative bacteria which trigger TLR4, may also explain why the elderly are highly susceptible to urinary tract infections caused by E. coli, and Proteus, Klebsiella, and Enterobacter species. The poor inflammatory response induced by the macrophages from the aged mice when stimulated TLR5 through the ligation by flagellin from S. typhimurium coupled with poor responses with LPS may explain why the aged mice and elderly humans are highly susceptible to enteric infections caused by E. coli, and Salmonella, Shigella, and Enterobacter species (26, 27). dsRNA (poly(I:C)) has been shown to be a ligand for TLR3 and poly(I:C) has been used to stimulate NK cells. The decline in TLR3 may be contributing to decreased NK cell function in aging and predisposes the elderly to viral, and intracellular, bacterial infections. An altered cytokine pattern with a bias toward Th2 is a hallmark of aging. Bacterial DNA containing CpG sequences has been shown to interact with TLR9 and induces a Th1 response (Refs. 1 , 2 , and 14 and unpublished results). Hence, reduced expression and function of TLR9 on aged macrophages could be responsible for the altered priming/recall microenvironment resulting in a Th2 bias in aging. Reduced expression and function of TLRs with aging thus impacts both the quality and magnitude of host innate and adaptive immune responses to bacterial and fungal infections by the altered inflammatory and priming environment. Hence, modulation of innate immunity through the up-regulation of TLR expression and function may be important for successful therapeutic and preventive immune intervention strategies for the elderly. We thank Drs. Chin-Yih Ou and Stephen Lindstrom for their assistance with the quantification of real-time RT-PCR and sequence analysis, respectively, and Thomas Rowe and Nancy Cox for their critical reading of the manuscript. ↵2 Abbreviations used in this paper: TLR, Toll-like receptor; ODN, oligodeoxynucleotide.